My home in Detroit is a one-bedroom apartment in a twenty-two-story structure designed by German architect Mies van der Rohe. This structure (along with several other parcels) was part of the first urban renewal project in America. The neighborhood, Lafayette Park, is now a historical landmark. In his designs, van der Rohe imagined structures that encouraged interactions among community members. It is quite impossible to descend upon the complex without encountering a dog walker, a neighbor, or a runner in the surrounding park area. If I look out my window, I see the city’s downtown landscape, the Canadian border and Detroit riverfront, and the second tower designed by van der Rohe for the 1960s initiative. This tower mirrors my own. It is a mid-century Modern design that includes a series of vertical and horizontal lines made of steel. Each line intersection produces a ninety-degree angle; the angles make up a series of rectangular shaped windows stacked on top and beside one another, producing a grid, itself situated in the larger rectangle that is the tower. Housed in each set of these intersecting lines is a tenant (or several) — a life, a home, a narrative. The Mies van der Rohe design and the many homes in it are not made possible without the grid. The grid is not made possible without the rectangle; and the rectangle could never be without the collaboration of multiple lines. I am thinking about the possibility of line, how it is able to extend itself, to reach another line, to intersect, to create a structure — a structure that can house people, their thoughts, their feelings, their stories, their sacred spaces. Artist Charles Gaines has worked closely with the possibility of line and more specifically, its ability to produce the grid, and he has used the grid as a template for storing aesthetic content. Gaines comes from a long lineage of artists who have used the grid to hold vestiges of objects, design, and modernity. Another descendant of this lineage, Samuel Levi Jones, has taken this a step further by using actual artifacts to fill the grid, assembling antiquated encyclopedias to make a series of squares. Jones has tapped into the minimalist work of Sol LeWitt and Piet Mondrian while conceptually subverting and interrogating the murky histories that these books contain. An intersection of socio-political elements complexly intertwined like quilted fabrics. Conversely, the intersecting lines in the van der Rohe design in Lafayette Park represent another aspect of modernity — not solely aesthetic, but also plagued by machinations of utopian ideals. Before the inception of these lines were envisioned by van der Rohe, a predominately Black neighborhood, called Black Bottom, occupied this land. 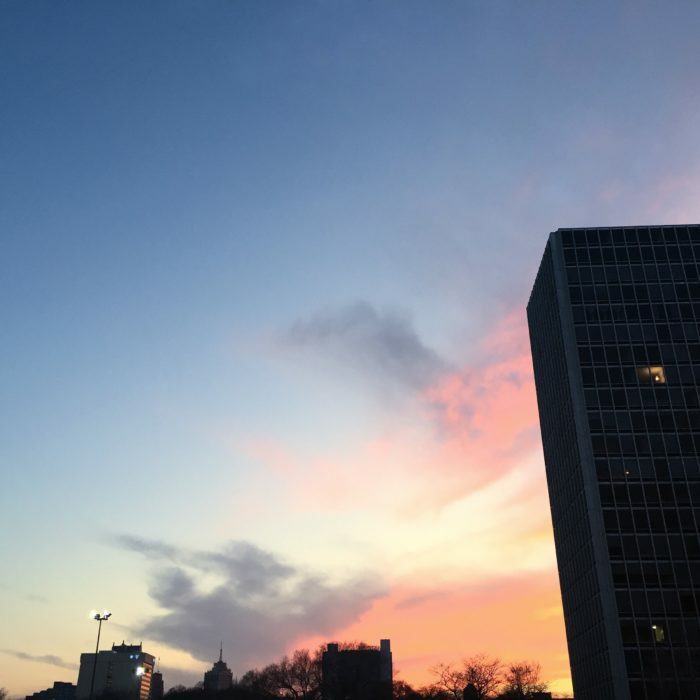 In an effort to keep white residents in the city, the neighborhood was bulldozed in the mid-twentieth century, and Lafayette Park was actualized as a part of a larger master plan by the city, incentivizing white residents to stay in Detroit. I think about those people who once occupied the land I now occupy, who called this same land their home. To have their own homes — those small intersecting lines that made up intimate single family houses and tenements — bulldozed, for an initiative that does not include them. Sometimes a line is drawn to yield exclusion; Detroit is gridded with such lines. Many of these grids are marked by ethnicity more than any other signifier. 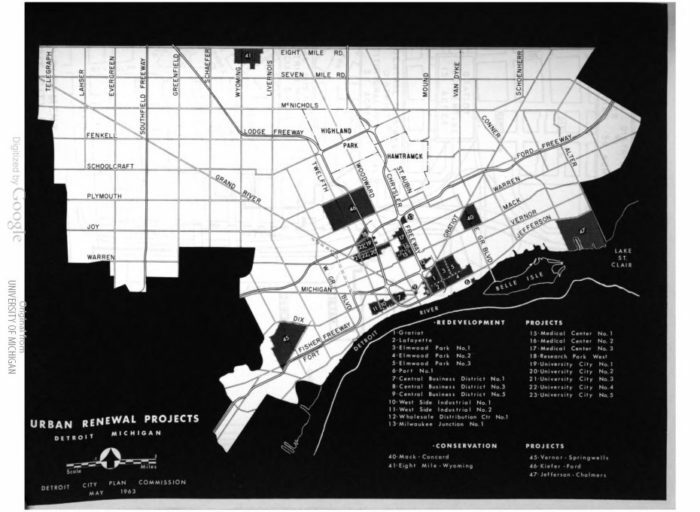 The city is known for its geographical segregation, and this cartography was made more indelible after the urban renewal project imagined by municipal leaders during this time. The failure of modernity lies in the fact that it was exclusionary. Lines played an integral role in keeping people out. I visited my grandmother yesterday. She is in her old age and her memory is fading. But she does remember when the Mies van der Rohe structure was built. It was several years after she migrated north from West Memphis, Arkansas, where she shared a small apartment with dozens of immediate and extended relatives. She came to Detroit, put herself through school, became a nurse, and married my grandfather. By the time the Mies van der Rohe design was actualized, she and my grandfather had two children and had purchased a small house in northwest Detroit. Although she never lived in the building, she remembers how eventful its construction was. “It was so nice and large,” as she recalls that I now live in the larger-than-life complex. My occupancy in this building makes her proud. She has never said this, but I presume that there might have been a certain set of lines that did not permit her occupancy in the building at that time. While I sit in her presence, I think about my ancestral line, and how the extension of this biological track yields a different set of experiences depending on where in time the line rests. For a moment, I wonder what the intangible points on a line for my future offspring will be. I then kiss my grandmother goodbye and head home.